In early April 1951, the Commanding Officer of the 1st Battalion of the Royal 22e Regiment wrote to Army Headquarters to point out a discrepancy between the General Orders and the metal regimental title currently on issue. In his letter, Lt-Col L.F. Trudeau wrote that General Order 203 of 1941 states that the title should read ‘R22eR’ and that ‘the Ordnance issue badges for the R22eR do not bear the ‘E’ required by General Orders.’ Lt-Col Trudeau suggested, rather than change the titles, that the GO be amended. 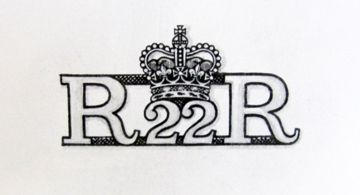 The title worn by ORs of the Royal 22nd Regiment. The CO of the 1st Battalion believed that the ‘E’ should be represented in a lower case ‘e’. Shortly thereafter, the General Officer Commanding Quebec District weighed in by pointing out that the original order suggested that the (uppercase) ‘E’ should actually be a (lowercase) ‘e’. However, nothing came from this and both sides agreed to disagree. Within two months approval was given for numerals to be added to the titles and the CO of the R22eR Regimental Depot was asked to review two proposals and to sign and return the design favoured by the Regiment. These two designs differed in having the numeral precede the Regimental abbreviation, or be placed above it. The chosen design was the latter and the dimensions were described as ‘letters ¼ inch high with the exception of the ‘E’ which is 1/8 inch in height.’ The width was to be one inch. One of two designs submitted to the R22eR. This one featured the battalion numeral preceding the title. Examples of the accepted design. None has been found for the 4th or 6th Battalions although they were most likely produced. In approving the drawing the CO of the Regimental Depot identified that the title was to be made of brass for Other Ranks but ignored specifying the material for titles worn by officers and Warrant Officers First Class and stated in an accompanying letter that the new design would not be worn by officers or WO 1. In response to a follow-up letter from AHQ, Maj-Gen Bernatchez informed them that the officers of the Regiment had worn a specific metal title since 1920 and ‘it would seem advisable that its use be continued.’ A sample of the title in question was included. Nonetheless, Bernatchez admitted that review of correspondence failed to uncover any information on how the badge came into use but it was requested Orders and Instructions for Dress be amended in order to authorize its continued use. The badge in question featured a crown above the R22eR. The problematic title. This pattern was taken into wear in 1920-21 but with no authority for its use. Once seen by AHQ, the R22eR title for officers caused concern. The use of the Crown on any insignia requires the approval of the Monarch and there was no evidence that such permission had ever been sought in the over 35 years that this title was in wear. When asked to explain its history the Regiment was at a loss. No records existed and it was evident that the badge had been brought into use without any approvals – at any level. A comparison of the sizes of the two titles. As officers wear rank stars it was not possible to make the title much larger. In an effort to further uncover the history of the title Bernatchez communicated with a number of retired officers as well as with the curator of the regimental museum. None could remember a formal request and all believed that the title dated from the era when the Regiment’s named was changed from 22 Infantry Regiment to Royal 22 Regiment. Further complicating the issue was a request from the Regiment to retain Tudor Crown (informally termed the King’s Crown) in lieu of adopting the St. Edward’s Crown as was dictated by Army Order 64-5 of 22 April 1953. The Regiment argued that the King’s Crown was taken into wear shortly after they had been awarded the title ‘Royal’ by H.M. King George V, in 1921. They included in their submission that the Regiment was formed under that King’s reign and was the first French-Canadian regiment to be made part of the Permanent Force. Under H.M. King George VI it was the only regiment to stand guard at Buckingham Palace formed completely of soldiers of non-British extraction (in 1938) and saw the Regiment grow from one battalion to three during his reign. Based on these points the Regiment sought permission to retain the Tudor Crown. Existing documents do not include AHQ’s answer to this request but it is known that the Crown did indeed change to the St. Edward’s Crown. Accordingly, the Governor General corresponded with Buckingham Palace and, on 17 December 1957, Government House confirmed that Her Majesty The Queen had given her approval. The badge is still worn today by officers and Chief Warrant Officers of the ‘Van Doos’. This drawing, from the Royal Warrant, shows the badge worn since 1958 and still in wear today. A Regimental Senate is usually comprised of the serving Battalion/Regimental commanders as well as previous COs and the Honourary Colonel. They act as a Board of Directors for the Regiment. At the time the R22eR consisted of five battalions, numbered 1 to 4 and 6 as well as a plain title for members posted to the Regimental Depot and those assigned to extra-regimental duties. Some exceptions existed, most notably that of the First Canadian Parachute Battalion. Correspondence from 1926 show that there was a concern about the actual translation of the Regimental name. General Order 149 of 1922 gave the French translation of Royal 22 Regiment as ‘22e Regiment Royal’ which, when translated back into English would read as ‘22nd Royal Regiment’. Records indicate that the translation was supplied by the King’s Printer and they were duly informed. Of interest is that the titles clearly stated R22eR and a note on the file shows that no title was approved for wear by officers. This would indicate that the ‘crowned’ title was in wear as early as 1926. You can ‘rate’ this article by clicking on the stars below.